You wanna hear a good story? 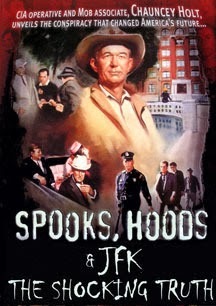 I mean a really good story?If so you should try and see Spooks, Hoods & JFK The Shocking Truth, because Chauncey Holt's story is a doozy. The film is largely an interview with Holt conducted eight days before he died in 1997 during which he tells his life story. From growing up as a bootlegger and moonshiner, to getting involved with organized crime, befriending Meyer Lansky, and working with the CIA. His work placed him, or so he says, in Dallas on November 22 1963. As with many other people Holt claims to know what really happened. Unlike many other people he was documents proving chunks of what he claims. Is it all true? beats me, but it is one hell of a story. Actually in this case it's not so much the story, but the teller,Holt is one hell of a storyteller spinning out his tae with the greatest of ease. Its a story that you fall into and the sort of thing that makes wonder when you get to the end where the previous two hours went to, time blows by. I have no idea if any of what he says is true. Clearly based on on the documentation some of it is, but thats not important. What is important is that over the course of two hours Holt, sitting alone in a chair, spins out his tale and holds you in rapt attention, something that many big budget Hollywood films never do. If you're interested in what may or may not have happened in Dallas in 1963 track this film down.